Has Vasyl Lomachenko got The 2017 Fighter of the Year Award all sewn up? There are still a few significant fights to be fought before 2017 comes to a close – the WBO middleweight title fight between champ Billy Joe Saunders and David Lemieux in Canada this Saturday (Dec. 16) – but by and large, all the big fights have been settled. And it’s been a pretty good year overall for fans of The Sweet Science; even if the past 12 months could also have been a bit better (more big heavyweight title fight action would certainly not have gone amiss). Pretty soon writers and fans will be making their decision on who they feel was The Fighter of The Year. There are a number of names who figure to be in the frame, but one man may well have got the award all sewn up: reigning pound-for-pound king and current WBO 130 pound champ Vasyl Lomachenko. Lomachenko craves the mega-fights, and we have to hope his enormous talents can be shown in full in big tests at 135 maybe even 140 pounds. But despite his modesty, Lomachenko looks a heavy and firm favourite to be looked at by most, if not all, as this year’s outstanding fighter. Three times “Hi-Tech” fought and three times he won, by corner retirement, having not even lost a single round of action. And the three men who were dominated and then vanquished by “Loma” were all capable, highly ranked and more than credible opponents. Jason Sosa was a WBA super-featherweight champion and after his April loss to Lomachenko he came back to give one-time pound-for-pounder Yuriorkis Gamboa a tough time; losing a highly debatable decision in November. Lomachenko was streets ahead of Sosa but he was not in with a gimme. Then, in August, tough, previously unstopped Colombian Miguel Marriaga was also made to quit whilst sitting down. Again, though he was expected to win (an expectation fans will likely have for the foreseeable future when the Ukrainian southpaw is in action), Lomachenko was not in with a stiff. And then to cap his year off, Lomacehnko turned a potentially tough fight into another easy night’s work. Some people have grumbled how the Rigondeaux fight was no test for Lomachenko, that the Cuban was too small. But “Rigo” called and called for the fight, insisting that he had Lomachenko’s number. If the fight had not been made, some people might have claimed Lomachenko was indeed ducking the unbeaten former 122 pound ruler. No, Lomacehnko is not deserving of any criticism over what went down in the December 9 fight or for taking it. It’s easy to be an after-timer, and many people were expecting a hard and testing fight for both men; or at the very least one that would, in testing both boxing brains, go the full 12 rounds. Lomachenko instead made it look almost pathetically easy. We can’t hold that against him. Nor can we hold it against him how he has made the job of picking this year’s Fighter of The Year a pretty easy task. Imagine what a great year Lomachenko is sure to have in 2018. 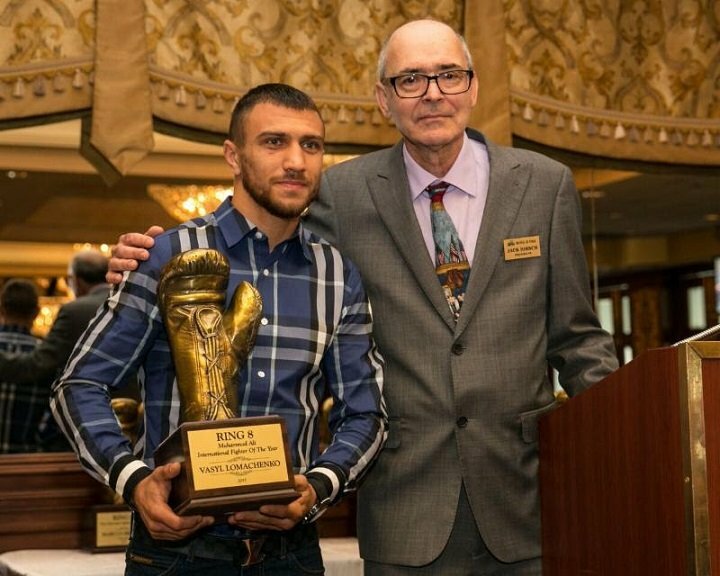 You are here: Home / Boxing News / Has Vasyl Lomachenko got The 2017 Fighter of the Year Award all sewn up?